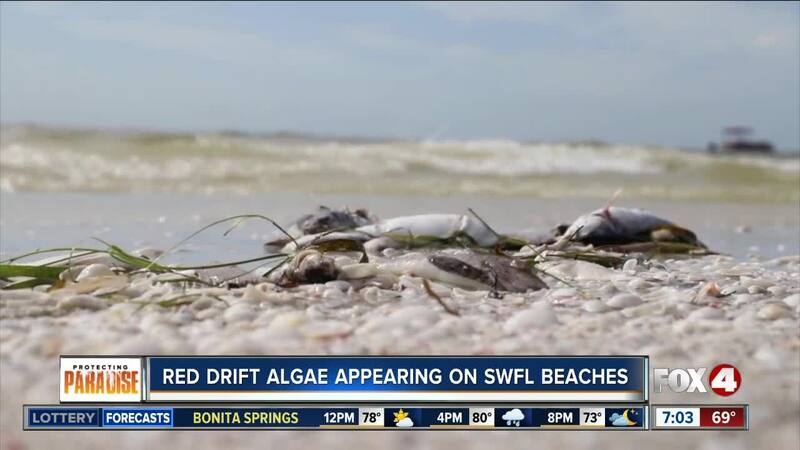 FORT MYERS BEACH, Fla. – Red drift algae is washing up on Southwest Florida beaches. However, it’s not red tide. It’s a different kind of algae. The difference between red drift algae and red tide is you can actually see it with the naked eye. When there’s a large red tide algae bloom, It discolors the water but otherwise, you would need a microscope to see red tide. Also, red tide is toxic and can kill marine life. When its airborne, it can cause respiratory affects on people. However, red drift algae does not have the same affect. According to Mote Marine Laboratory , it’s not harmful or toxic but it can smell bad. It smells when it decomposes, especially when marine animals like fish are caught in it. It’s a macroalgae that can be seen on the beach after it detaches from the bottom. It's natural just like red tide and can be found any month of the year. It varies in color between red, brown, green or white. Red drift algae is also present on beaches in Sanibel Island, Bonita Springs, North Naples and Marco Island. Scientists say red drift algae may be formed by seasonal nutrients runoff. Red drift algae can also be an eyesore. When there’s a large amount of red drift algae, local officials sometimes choose to remove it from the beaches. However, those decisions are made on a beach by beach basis.